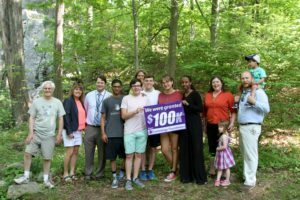 The Friends of the Middlesex Fells Reservation is one of 100 local nonprofit organizations to receive a grant of $100,000 through the Cummings Foundation’s “$100K for 100” program. On May 25, 2016 the Melrose-based organization was chosen from a total of 479 applicants during a competitive review process. The Friends of the Middlesex Fells Reservation is dedicated to the protection and harmonious use of the Fells promoting awareness, policies, and programs to honor and preserve the ecological, historical and recreational resources of this urban forest reservation. The Friends of the Middlesex Fells Reservation will be represented by Neil O. Anderson, Executive Director, and Lindsay Beal, Board Vice-Chairperson, along with approximately 300 other guests at a June 9th reception at the TradeCenter in Woburn to celebrate the foundation’s most recent $10 million infusion into Greater Boston’s nonprofit sector. With the conclusion of this grant cycle, the Cummings Foundation has now awarded more than $140 million to local nonprofits alone. Neil Anderson, the Friends of the Fells (the “Friends”) Executive Director stated, “We are tremendously excited and honored to receive this grant. It will enable us to expand our programming and increase our impact in ways not formerly possible, especially as it pertains to engaging youth with nature learning and environmental education. The Friends will use the funding to further expand their Forest Learning initiatives to run year-round. They will serve elementary and middle school aged students and replicate their pilot program currently operating at Medford High School, the Mustangs of the Fells, to other area high schools including Stoneham, Malden, Melrose, and Winchester. The Mustangs of the Fells was piloted through a Medford Health Matters grant in 2015 and directly engages students in recreational and educational activity in the Fells, as well as in environmental stewardship. This year’s diverse group of grant recipients represents a wide variety of causes, including education, homelessness prevention, elder services, healthcare, and food insecurity. Most of the grants will be paid over two to five years. The complete list of the 100 grant winners will be available on June 9th at www.CummingsFoundation.org. About the Friends of the Middlesex Fells Reservation Inc. 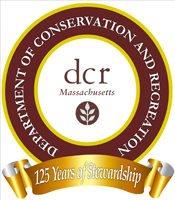 Incorporated in 1986, the Friends of the Middlesex Fells Reservation is committed to preserving the landscape and heritage of the Middlesex Fells Reservation for current and future generations. The Friends instill awareness and appreciation of the Fells as a valuable natural and historical resource, which will foster a sense of stewardship within the larger community. The Friends develop programs for recreation, enjoyment, and study of the Fells that are harmonious with landscape and habitat, and develop and advocate for policies designed to preserve and protect the Fells. For more information about the Friends is available at http://www.friendsofthefells.org/. Joyce and Bill Cummings of Winchester established Woburn-based Cummings Foundation, Inc. in 1986. With assets exceeding $1 billion, it is one of the largest foundations in New England. The Foundation directly operates its own charitable subsidiaries, including two New Horizons retirement communities in Marlborough and Woburn. Its single largest commitment to date was $50 million to Cummings School of Veterinary Medicine at Tufts University. Additional information is available at www.CummingsFoundation.org. 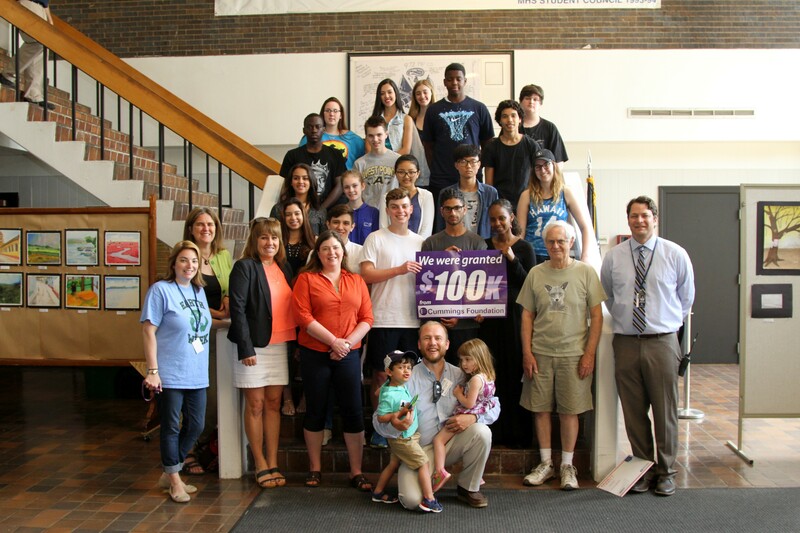 Students from the Mustangs of the Fells join Dr. John Perella, Medford High School Headmaster, Caroline Colarusso, Selectwoman, Town of Stoneham, and Neil O. Anderson, Lindsay Beal, Ann Frenning-Kossuth, and Bryan Hamlin of the Friends of the Middlesex Fells Reservation Inc. to celebrate receipt of “$100K for 100” grant from the Cummings Foundation.